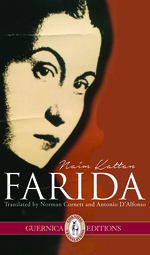 In a recent interview recent interview with CKUT’s Rana Alrabi, Norman Cornett speaks about Naim Kattan’s Farida. He elaborates on Kattan’s life and how it influences his writing; on the importance of Farida in showcasing a much needed alternate vision of Iraq; and on the significance which the book holds in education, as it presents a portrayal of Iraq that is often omitted in the media today. Cornett elaborates on the way in which Kattan is able to offer a portrayal of an often forgotten reality of Iraq: a country which is not solely defined by its political and social troubles, but one which has a long multicultural and multiethnic history. Cornett goes on to explain why he felt compelled to translate Farida into English. Furthermore, he stresses the importance that this alternate vision holds when it comes to education in particular, as his teaching has led him to realize that many students have no idea that a vibrant Jewish community existed in Iraq. He explains that Naim Kattan’s novel teaches readers of the complex reality of the country by allowing us to see “la longue duree,” an approach to the study of history coined by Fernand Braudel. As part of his educative approach, Cornett holds dialogic sessions, which are set up as a “catalyst for collective conversation in creative thinking and expression.” He comments on how he encourages his students to discover history in these classes by setting up opportunities for them to interact, one on one, with the authors of studied works. In this way, he is able to “make history come alive” in his classes. Naim Kattan was a guest, on numerous occasions, in Cornett’s classes, and the experience was rewarding for both him and his students.